Italian takes first professional victory at one of the biggest races in the season, with EF-Education First teammates proving pivotal to success. Alberto Bettiol (EF-Education First) launched himself on the final ascent of the Oude-Kwaremont to take his first professional win, and one of the biggest in his team’s history at the Tour of Flanders, Sunday. After a strong showing through the early classics, the Italian soloed to victory, holding off a group that included so many fast-men that none were willing to drag each other toward a potential sprint finale. After a long time in the break, Kasper Asgreen (Deceuninck-Quick-Step) was able to sprint from the chase group to take second, with Alexander Kristoff (UAE-Team Emirates) taking third. 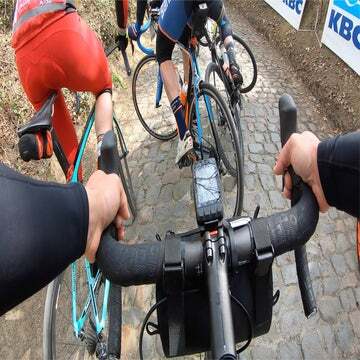 As is typical of the Tour of Flanders, the action only truly commenced with 60km to go, as the race approached the Oude-Kwaremont for the second time. The peloton was all largely together, except for 2018 champion Niki Terpstra (Direct Energie), who crashed early in the race and was taken away to hospital. He was later confirmed to be OK, but will not be racing at Paris-Roubaix next weekend. Having double punctured and crashed heavily on a descent with 70km to go, pre-race favorite Mathieu van der Poel (Corend0n-Circus) was chasing furiously to catch on to the main peloton. A group of dangermen went away on the Kwaremont, made up of Stijn Vandenbergh (Ag2r-La Mondiale), Sep Vanmarcke (EF-Education First), and Asgreen. Shortly afterward, Dylan van Baarle (Team Sky) bridged to form a quartet at the front of the race. Vanderburgh was the first to crack and fall back from the breakaway as the race hit the Taaienberg, at which point the pace was sky high, and the peloton was rapidly shelling riders out of the back, as the constant fight for position going into the bergs and fierce effort over the cobbles bit. With 30km to go, van der Poel had made it back into the peloton and recovered after his huge effort, and promptly started animating the group, attacking on the Kruisberg, drawing out reactions from Bob Jungels (Deceuninck-Quick-Step), Alejandro Valverde (Movistar) and Greg van Avermaet (CCC-Team). 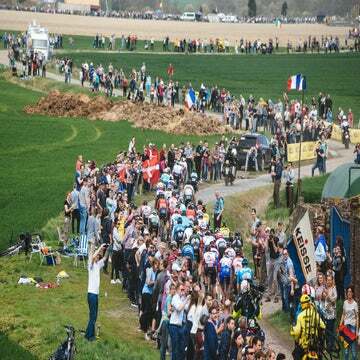 The final double-header of the Kwaremont and Paterberg climbs approached, and Vanmarcke looked to have cracked, falling back out of the break into the group of chasers, which now numbered only 20-25 riders. However, with teammates Bettiol and Sebastian Langeveld both in the bunch, this later appeared to be a clever tactical move. EF-Education First set Bettiol loose on the final climb of the Kwaremont, by which point all the breakaway men had been caught. As has been common all season, van Avermaet was one of the first to respond in leading a chase, yet with Langeveld disrupting the rhythm, and the sheer ferocity of Bettiol’s acceleration, the Italian was 10 seconds in the lead by the summit of the berg. Bettiol grew his lead over the final climb of the Paterberg, and found himself with around a 20-second lead with just the final flat run into Oudenaarde to contend with. “On the Paterberg I don’t think I lost a lot and then it was the longest 14km of my life,” the winner remarked. 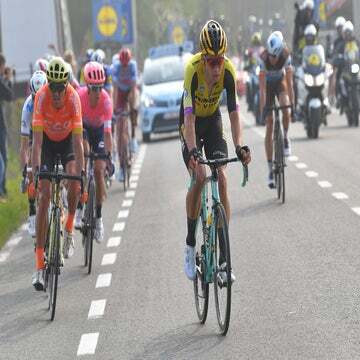 The chase group included an array of fast-men who could win from a sprint, notably Michael Matthews (Sunweb), Peter Sagan (Bora-Hansgrohe), Yves Lampaert (Deceuninck-Quick-Step), Wout van Aert (Jumbo-Visma), Kristoff, van Avermaet, and Valverde. After initial testing moves by Sagan and Van Avermaet, the chase group neutralized itself, none willing to commit to the chase. Langeveld continued to sit near the front of the group, constantly disrupting any momentum they did gain. Meanwhile, up the road, despite the visual signs of fatigue in his form, Bettiol was starting to grow his lead, and the chasers wasted their chance at bringing him back. The 25-year-old crossed the line 14 seconds ahead of second-place Asgreen, who attacked from the chasers in the final half-kilometer. Having been in the break for so long, the young Dane took a well-deserved podium, with Kristoff easily winning the sprint for third. Van der Poel took a well-deserved fourth place after crashing so heavily, chasing back, and then repeatedly attacking in the dying stages of the race.